Google Webmaster Tools is a free service that provides a wealth of information directly from Google. Once you have verified a site with Google, they’ll give you access to all sorts of information. 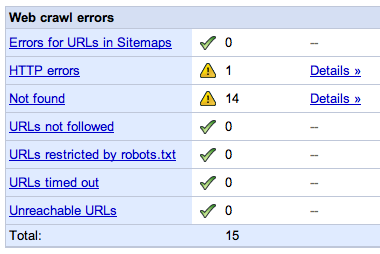 Google Webmaster Tools will show all sorts of errors with a site. Not only does it show broken links on the site, but also links that are driving traffic to the site for which there is no valid page. Google even tells you pages it knows about but has been restricted from crawling. That’s good to know incase someone accidently blocks to much. Tell Google to show your page with the www or without, set a geographic target and select if you want the images show up in Google’s enhanced image search; aka Google Image Labeler. Google will provide a list of URLs that have duplicate title tags or duplicate meta descriptions as well as if there are pages with to short, or to long, meta descriptions or titles. Ever wondered what people search for that your show up for? Outside of the obvious of course. This type of information is available in Google Webmaster Tools. 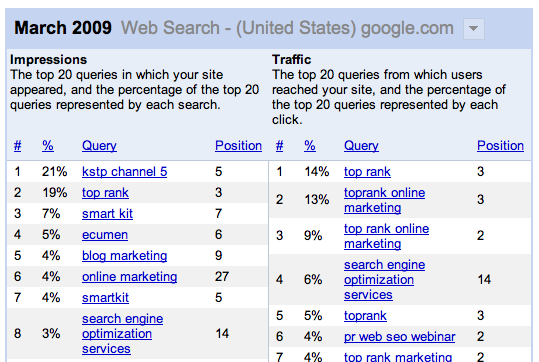 It shows what a site is showing up for and what people are clicking though on along with your ranking. It can even be filtered by type of search (web, image, mobile) and by country. If a site is lucky enough to get an additional block of links under their listing in Google, these can be managed in Google Webmaster Tools. You can’t tell Google what pages to add, but you can tell Google not to show a sitelink it has created. These are just a few of the features of Google Webmaster Tools. Google continues to add additional features and functionality and we can only hope other search engines follow suit.